[Extract] Australian studio Biasol paired worn concrete walls with pink marble and rich red accents for the interiors of this Italian restaurant in Melbourne, which takes visual cues from Ancient Rome. Pentolina is set inside a 100-year-old building on Little Collins street, surrounded by a host of other eateries and shops. Its owner had been a barista at a nearby Italian espresso bar, Pellegrini’s, for 19 years, when he decided to follow in the steps of his father and open a pasta restaurant. He charged local studio Biasol with the task of designing it. 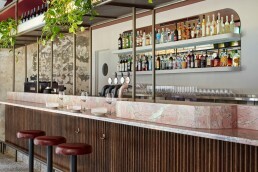 “He wanted to bring out the nostalgia of traditional Roman pasta bars in a contemporary way fitting to Melbourne’s thriving hospitality culture,” Jean-Pierre Biasol, principal of the studio, told Dezeen.